8.17 points at 41 votes (rank 53). Thalamus, known for its ingeniously well-engineered and extremely perfectionist games, released with Hawkeye a really precious game. Here you control a man -half human, half robot- that fights through 12 levels and additionally collects some puzzle pieces on the way. If he has collected 4 puzzle pieces, he can leave the level (on the right side) and enter a new level. 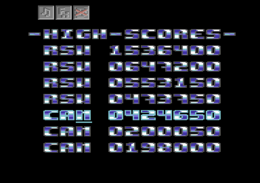 Each level differs graphically and was desgined very successfully for C64 measures. It is easier to channel through the alien attacks when you carry with you a fair weapon armoury. In the SLF, the Synthetic Life Form, this is well equipped. There is e.g. the simple pistol with countless ammunition, then some heavier cannonry but with limited munitions: a machine gun, a laser (very efficient! ), and a rocket launcher (slow, but the strongest weapon). Every now and then you can find lying on the way next to the puzzle pieces some additional munition and other options, which come in handy. Technically everything knows to please, starting from the stirring music by Charles Deneen and Jeroen Tel, over the graphics designed by real artists, the fantastic playability, to the whole design which could not have been made better. Even a bonuslevel is available... but to reach it without cheating is only manageable for real joystick acrobats. Every level consists of several screens which are attached together and scroll back and forth. If you have collected all puzzle pieces, it might be worth to go back again to maybe find a useful extra in the level. By each grade is gets a bit harder, but not unfair; I once made it to level 11 and I think you can play it to the end without cheating. Every now and then really big grumps appear in the level, against which you should, depending on the situation, use the bigger weapons. The direction in which the puzzle and extra pieces can be found, can be recognized by the flashing eagle eye (Hawkeye), which are placed top left and right; this way you do not waste unnecessarily time and energy with searching. From the "Header" you can also see how many puzzle pieces you have collected already. As long as you still have enough energy, shoot the rest of the munition to reach more points. 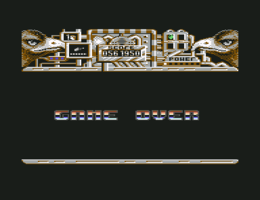 When the game is over prematurely (GAME OVER), you have the possibility to play the last level again with endless lives so you can make it next time. To jump press the joystick upwards. HAWKEYE moves diagonally to the uper left or right, as long as the joystick is pressed into the corresponding direction. You can do jumps over different distances. Choosing weapons: Keep fire pressed until the icon lights up and then press "left" or "right" to choose the desired weapon. There is a secret level. You get there automaticall when you make the first five (!) levels without losing a life. Oh, great! On some depths precise jumping is the most important premise. 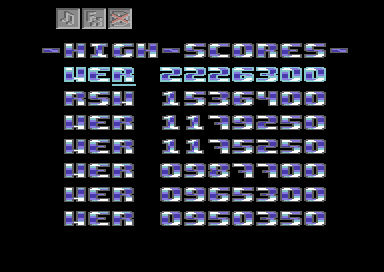 But when you press RUN/STOP at the same time, the jumping width doubles and as a useful side effect the sprites are shifted in the scrolling direction. On the title screen you should enter »VALSSPELER«, to get a clear line to level 9. Z-Mat: "In the whole game I found altoghether about two almost unfair situations (thats not a lot! ), for one there is a situation in the 5th level, where you have to jump from an abyss over a hole, and at the same time you crash with a hand that rises out of a tree. I have found out a trick to do that: while jumping you just press the RUN/STOP key: then SLF jumps further and the sprites shift (so does the hand). Just try it... The other wanted situation is in the 11th level; a section where you are not allowed to fall, because you won't get out again due to the wide holes. Here also the RUN/STOP trick helps... Apart from that there is no more critics from me." 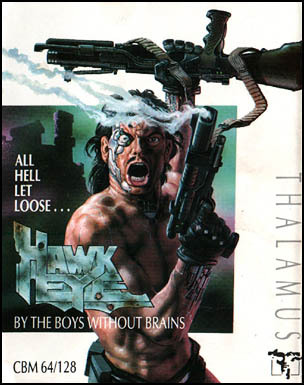 Guybrush: "Shooting free of sense but on an upscale level, although it cannot hold up to Turrican. 6 points from me." Werner: "Hawkeye is an absolute cult game. No collection should miss it!" Robotron2084: "Behind a perfect facade of an optical-acoustic illusion hides one of the really worst Run&Gun games of all times concerning the gameplay. Walking left - walking right - walking left - walking right and a bit of shooting, that's all. Additionally, precious game area is wasted to useless graphical decoration. Hawkeye? I'd rather call it DORKeye! 5 out of 10 points." This page was last modified on 20 July 2017, at 12:48.